Savory pies and enriched breads figure prominently on the Easter dinner table. We’ve already featured a couple Neapolitan examples on the blog: the casatiello and the incredibly rich pizza rustica. Today we head north to Liguria to present another classic savory pie served around Easter time: la torta pasqualina or, “Easter Pie”. 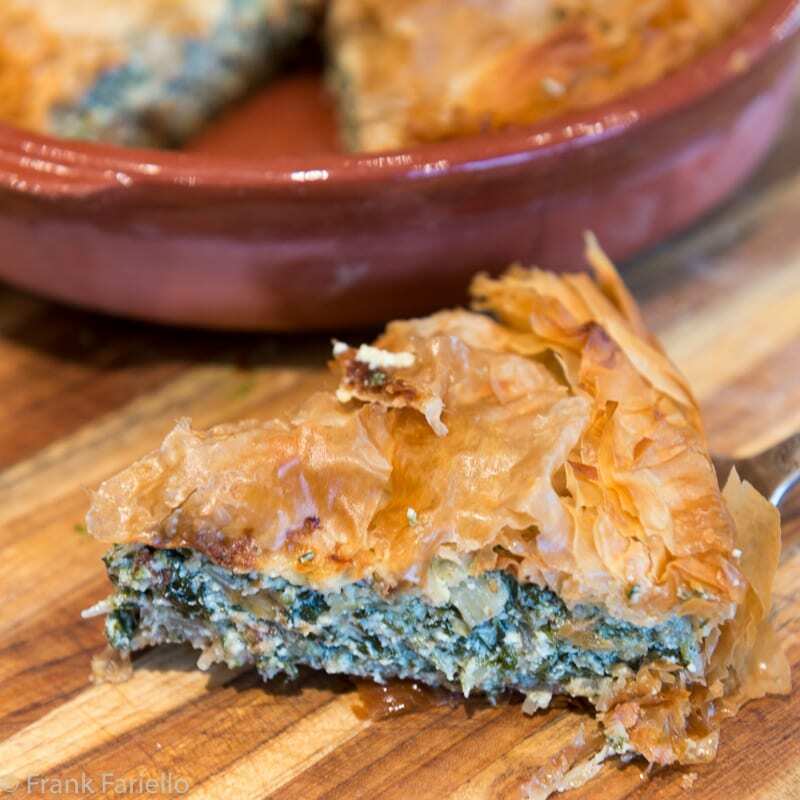 Traditionally made from multiple layers of ultrathin dough—legend has it 33, one for each year of Christ’s life, although seven or eight are more usual—these days time-pressed home cooks like myself might opt for phyllo dough or, as presented here, puff pastry. 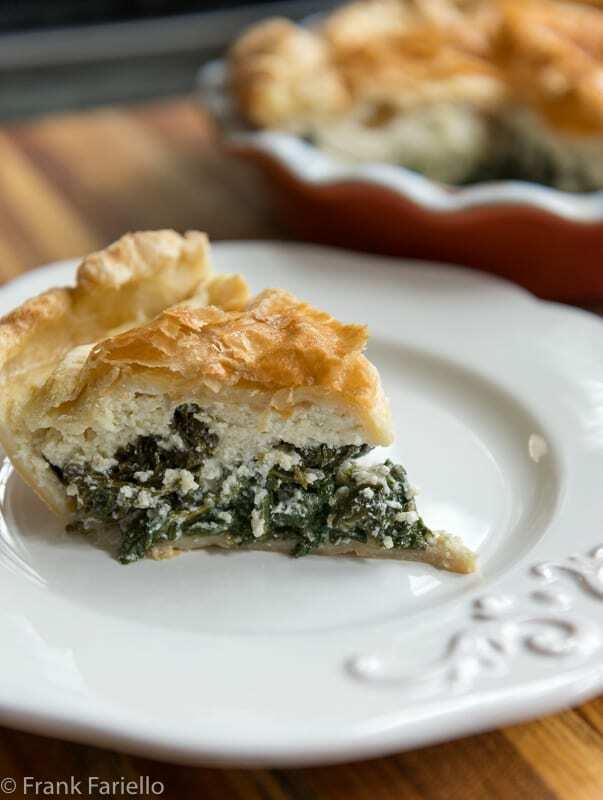 The stuffing is made from Swiss chard or spinach or both, scented with onion and nutmeg and perhaps other spices, over which a slightly tart Ligurian cream cheese called prescinseua is laid. (Here we have simulated prescineua by mixing ricotta and Greek yogurt.) Eggs are gently placed into wells in the stuffing, and it’s all topped with another layer of pastry and finally baked in the oven until golden brown. Simple though it is, the taste is amazing and the various layers of the filling are quite attractive as you cut into it, especially if you catch a bit of egg yolk. Torta pasqualina can be eaten over the course of several days after it is made. Leftovers make for a lovely picnic food for Easter Monday. Wash the greens well and trim off any large stems, then parboil them for a few minute, just until they have wilted. Drain, squeeze dry and roughly chop them. Sauté the onion in a skillet with a generous glug of olive oil until it is soft and translucent. Add the chopped greens and let them wilt, mixing all the time so they become impregnated with the flavor of the soffritto. Strip the leaves off the sprig of marjoram and add them to the greens, along with the nutmeg, clove, salt and pepper. Let the mixture simmer gently for a minute or two so the flavors meld. Turn off the heat and set aside to cool completely. Mix the ricotta and Greek yogurt in a bowl, together with an egg, a healthy pinch of grated Parmesan, salt and pepper. (Some grated nutmeg or clove here, too, wouldn’t be amiss.) Set aside. Lay one sheet of the puff pastry over a well-greased 22cm/9 inch pie plate. (The pastry should hang over the sides of the plate; you may need to roll out a store-bought sheet a bit, as I did.) Lay the greens over the bottom. Top with half of the remaining grated Parmesan cheese. Then lay on top the ricotta and yogurt mixture. Make 3 or 4 slight depressions in the filling with a wooden spoon, then break an egg into each well. Season with salt and pepper, sprinkle with the rest of the grated Parmesan cheese, then finally drizzle everything with some olive oil. 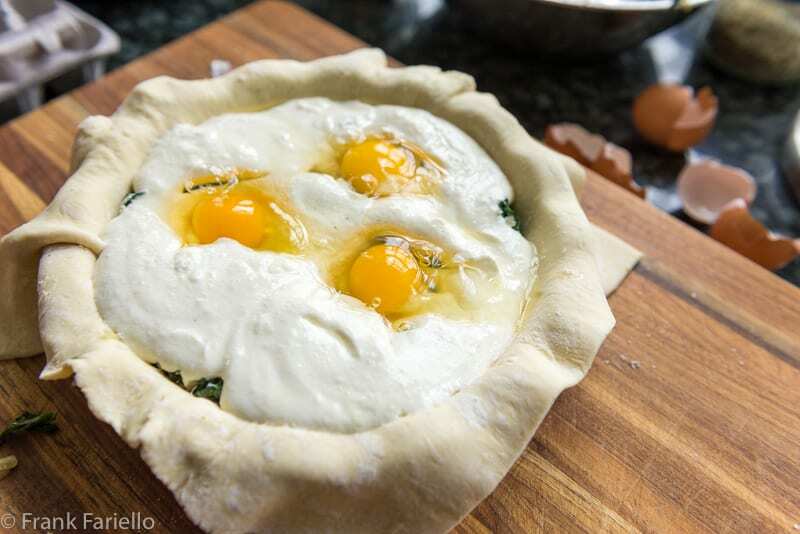 If you like, brush the puff pastry with beaten egg yolk for extra sheen. Bake the pie in a pre-heated oven at 180C/350F for about an hour, or until the top is golden brown. Let the torta pasqualina cool completely before serving. If you want to simplify your life even further, do as many people do and just use ricotta rather than the ricotta and yogurt. You can, in fact, mix the ricotta, Parmesan and greens together into a smooth, even paste rather than layering it all separately. This provides a more “even” taste, not unlike the typical filling for ravioli, although the layering method is original to the dish and, to my mind, more interesting. The eggs, too, can be mixing in rather than laid on top—although that sacrifices the visual drama, too. Sometimes an egg is beaten into the ricotta to stiffen it up, even if you’re laying on whole eggs afterwards. And if you’re not partial to leafy greens, you can make torta pasqualina with sautéed artichoke hearts, the way that a Ligurian office meat of mine tells me his family makes it. Store-bought puff pastry makes a fine crust, in my opinion, and renders the dish almost effortless. Last year I made a torta pasqualina with multiple layers of phyllo dough, top and bottom, brushing each layer with olive oil. I liked the result, though not quite as much as this year’s puff pastry version. Last year’s torta pasqualina, made with phyllo dough and spinach and ricotta filling. On the other hand, if you’re feeling ambitious and want the full-court-press traditional dish, you can make your own dough. It is a simple mixture of flour, salt, water and olive oil, but requires rolling out into paper thin sheets and layering each sheet with brushings of olive oil. Check out this blog post, from cyberfriend Stefano. It gives you detailed instructions on making this dough—and for the last word on making torta pasqualina in general. Mix the ricotta and Greek yogurt in a bowl, together with an egg, a healthy pinch of grated Parmesan, salt and pepper. (Some grated nutmeg or clove here, too, wouldn't be amiss.) Set aside. 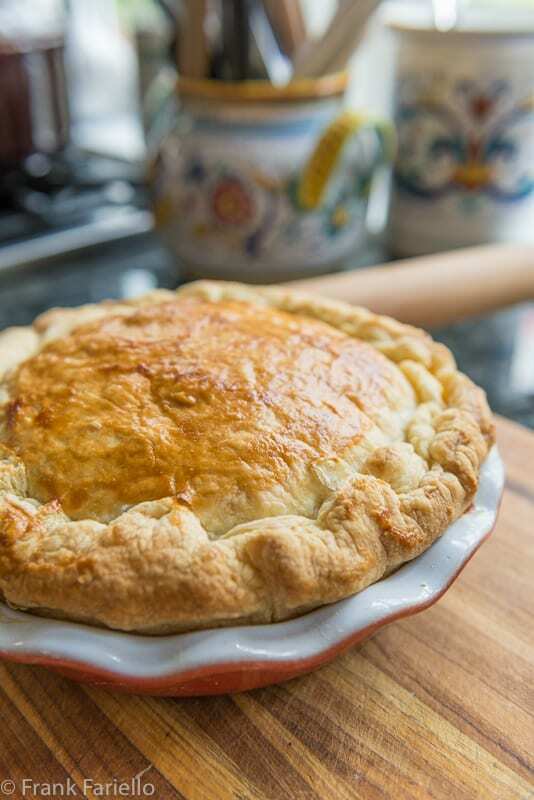 Lay one sheet of the puff pastry over a well-greased 9 inch pie plate. (The pastry should hang over the sides of the plate; you may need to roll out a store-bought sheet a bit, as I did.) Lay the greens over the bottom. Top with half of the remaining grated Parmesan cheese. Lay over the second sheet of puff pastry. Trim around the edges of the pie plate, leaving an overhang of about 2cm or 1/2 inch. 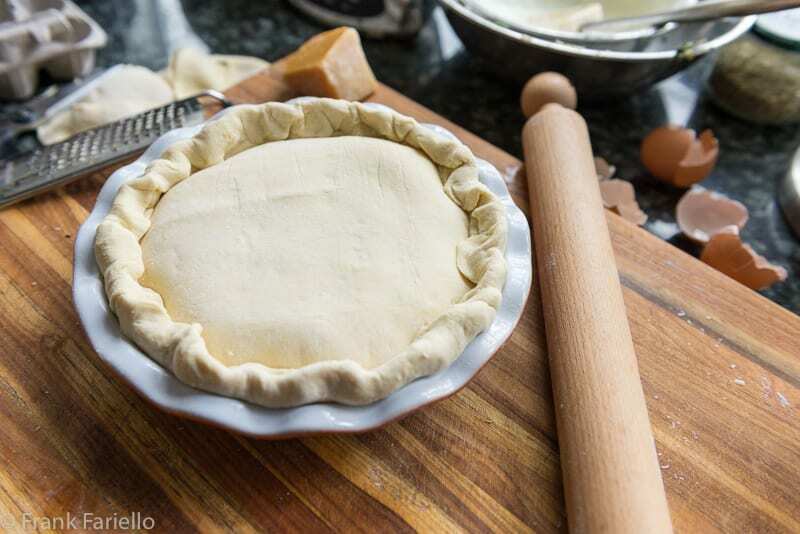 Now roll up the extra pastry onto the pie plate, pressing the two sheets together as you go, to form a kind of cord.If you like, brush the puff pastry with beaten egg yolk for extra sheen. Excellent. I’ve made this a variety of ways — with/without crust, usually all mixed together but sometimes eggs in pockets. I’ve never seen it with the separate layer. Will definitely make it this way next time. Worth a try, TJP. They say it’s the original way, although as you say this dish is delicious made many different ways. Like everyone said, this puffy pastry just looks gorgeous! The addition of eggs on top of cheese makes definitely makes it magical! Will have to try this recipe soon! Thanks for sharing. Thanks, Yi! Do let us know how you like it. Finally catching up on some blog reading. I like the idea of using puff pastry in place of the laborious traditional crust ~ although I do intend to tackle that one day. I’ll check out Stefano’s post. Hope you had a good Easter holiday, Frank! I do, too, Domenica. I was even going to tackle it for this post, but I’m just too busy at the moment! Even when Easter is gone and over I will try this delicious recipe, thanks for sharing and have a great weekend! I love these Easter pies. I make the Rustica – which is really too rich for us these days. I love how this is lightened up. And those eggs – oh my! What a beautiful pitta (as we call these savory pies here in Greece)! LOVED that idea of the whole eggs nested in the greens. 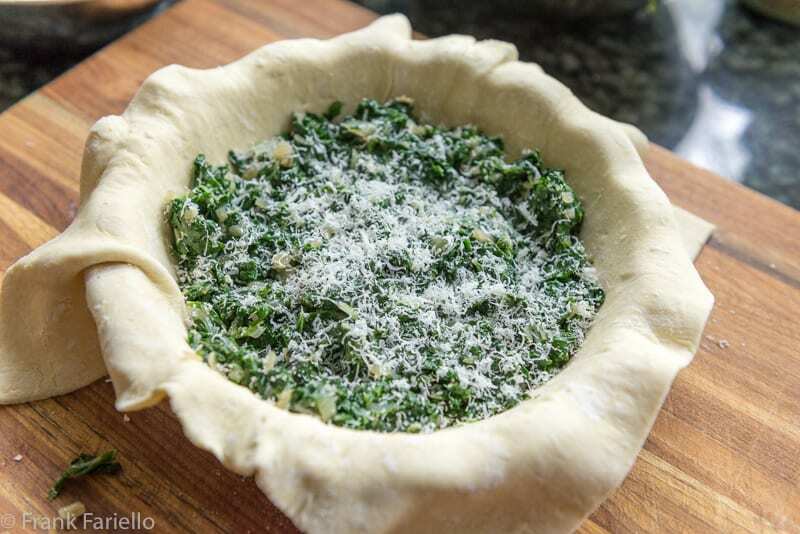 Even though we bake countless variations of savory pies we never tried this technique before. Delicious idea dear Frank! You’re welcome! The eggs really do make for a lovely effect, I have to agree. I am sorry I missed this but this torta would have been perfect for our Easter brunch in Germany. It’s looks so good. I have just been chatting back and forth with Stefano about savory pies and he sent me to yours! I somehow missed this post, Frank, so I am glad he mentioned it. I have never had a torta Pasqualina, and I missed Easter this year flying cross country. Is it okay do have a make-up date? Frank – That is one gorgeous pie. It seems that nearly every region has its version of this. The whole eggs in the center make such a beautiful and delicious statement. Although from Calabria, my grandmother made something quite similar at Easter time. Greens, ricotta, local cheese and fresh eggs nestled in pockets. Buon Pasquetta Frank! Does sound much like this one. I’m sure it’s delicious, too. Just had this delicious torta served with sauteed red peppers and cherry tomatoes in garlic infused olive oil. And a a cheeky glass of red! Thanks Frank! And thank you for your kind comment, Susie. Glad you enjoyed it. ciao David, the sweet chard sweet pie is one of my favorite dessert too. Absolutely. Beautiful! I had no idea that some of the eggs are left whole! Note to self : Read all instructions thoroughly. Then re-read! I cut off the over hang, and made a cord to go on top! Oh dear. The cord fell off and some of the filling came out. Almost a disaster. You should have seem me scooping molten pastry back on top of the pie! Looks a mess but I bet it tastes good. Happy Easter everyone! Glad at least the taste was good… Many of my best lessons in the kitchen were learning from mistakes, I think it’s true of every cook. Happy Easter! olive oil pastry, butter pastry, what-ever pastry: these vegetables pies are always delicious. Really like savory pies. And love Swiss chard — we always plant some in our garden. So this recipe is perfect for our house. Thanks! Never seen this or tried this one, but again, would LOVE it! It’s really pretty quick and easy by using the puff pastry. Your final product looks absolutely gorgeous, too! Buona Pasqua to you and your family, Frank! Buona Pasqua to you and yours, Christina! What a wonderful torta. I’ve got to make it so my children can sample it. This year my oldest son wanted an au gratin out of Swiss Chard — we make it at Thanksgiving. 🙂 But it would go nuts over this recipe. I’m saving it. Buona Pasqua, Frank!! Buona Pasqua to you and yours, Marisa Franca! la torta pasqualina è il piatto più significativo della Pasqua,nato in Liguria adesso è conosciuto in tutto il mondo ! Buona Pasqua Frank a te e ai tuoi cari, un abbraccio ! Pasqualina becomes Pascualina in Argentina, where many people from Liguria and southern Piemonte emigrated. I buy my “tapas de pasqualina” at a Cono Sur butcher’s and grocery around the corner. The recipe down there tends to integrate at least one egg and cheese into the main filling, but the eggs are inserted as per the Ligurian original. Don’t forget, in Liguria many wild greens grow, and other herbs fit well into the Pascqualina, wherever it is cooked and eaten. It is also a very thoughtful dish if you have vegetarian guests, as long as they aren’t vegan. The Argentine variation tends to have two crusts, meaning that it can be frozen well. Not surprising given the background of so many Argentines. A country I visited very briefly many years ago—and I’m dying to go back. Buona Pasqua!